Chetsün Nyingtik (Tib. ལྕེ་བཙུན་སྙིང་ཐིག, Wyl. lce btsun snying thig) — among the “seven authoritative transmissions” of the great Jamyang Khyentse Wangpo (1820-1892), the profound cycle of teachings known as Chetsün Nyingtik belong to the category of ‘recollection’ or ‘reminiscence’ (Tib. རྗེས་དྲན་, jé dren). When Jamyang Khyentse was twenty-four years old, he visited the sacred place of Uyuk in the Tsang province of Central Tibet. His perception of ordinary phenomena vanished into an experience of pure luminosity and he clearly remembered Chetsün Senge Wangchuk (11th Century) attaining the rainbow body in that very place. 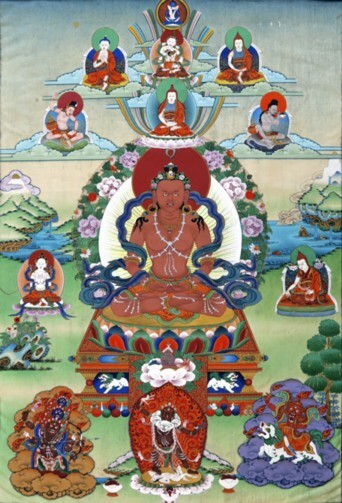 Before achieving the rainbow body, Senge Wangchuk had, for a whole month, experienced a vision of Vimalamitra, in which he bestowed upon him the quintessence of his teachings, the Vima Nyingtik. Following this reminiscence, Khyentse Wangpo, who was an emanation of both Vimalamitra and Senge Wangchuk, put into writing the root text of the Chetsün Nyingtik, the ‘Heart Essence of Chetsün’. He practised these teachings and kept them secret for many years. Then, when he was thirty-eight years old, the protectress Ekadzati requested him to disclose these teachings and impart them to others. Khyentse Wangpo first gave a ‘one-to-one’ transmission to Jamgön Kongtrul Lodrö Thayé. Later on, he imparted the transmission to a few others among his main disciples, such as Adzom Drukpa (1842-1924), Tertön Sogyal Lerab Lingpa (1856-1926), Jedrung Trinlé Jampa Jungné (1856-1922) and Khenchen Tashi Özer (1836-1910). Following this, his main Dharma heir, Jamgön Kongtrul the Great, wrote a series of texts for practising the cycle. According to Dilgo Khyentse Rinpoche, among the teachings revealed by Khyentse Wangpo which relate to Dzogpachenpo, the Chetsün Nyingtik represents the profound aspect, while the Bimé Lhadrup from the Chime Phakme Nyingtik cycle represents the vast aspect. Colophon: Written by Lodrö Thayé in a place of solitude. May virtue and well-being increase! Colophon: Thus, Ödsal Trulpa’i Dorje compiled this, Perfect Secret Wisdom, according to the commentary distilling the essence, entitled Perfect Secret Bindu, for the sole purpose of recitation practice. Some elaborations have been included here. May this virtue be cause for all who connect to this to breathe the breath of freedom in the original ground of Buddha Samantabhadra! Lineage Prayer of the Great Chetsun’s Profound Essence of Vimalamitra: Rain Showers of the Two Siddhis, by Adzom Drukpa Drodul Pawo Dorje (lce btsun chen po'i bi ma'i zab tig gi brgyud 'debs grub gnyis char 'bebs) (95-97), including the supplements ?previously 2 entries with different authors? Colophon: This supplication was written by the Mantrayāna practitioner Vidyādhara Natsok Rangdrol [Adzom Drugpa], based upon whatever came to mind. May virtue prevail! Colophon: Hence, the Great Tertön Vajra Holder [Jamyang Khyentse Wangpo] authorized me as the guardian of these teachings and bestowed upon me the crown ornament of names, Rigdzin Natsok Rangdrol [Adzom Drugpa]. He gave his vajra command, saying, “You are responsible for compiling the commentary, additional practices, and this sādhana.” According to his wish, I composed this, and once again, he [the guru] made corrections and additions. I completed this while supplicating the guru in my meditation hut, located at the foot of a mountain resembling an auspicious coiling white conch. By this virtue, may those who enter this path with faith and devotion perfect the four visions in their lifetime and spontaneously accomplish the benefit of self and others. May virtue prevail! ↑ Based on Matthieu Ricard’s Introduction to the Chetsün Nyingtik Chökor, Tib. ལྕེ་བཙུན་སྙིང་ཐིག་གི་ཆོས་སྐོར་, Wyl. lce btsun snying thig gi chos skor, Shechen Publications, Delhi, 2004. This page was last edited on 13 August 2018, at 23:43.